I fully admit it: I’m still in shock. 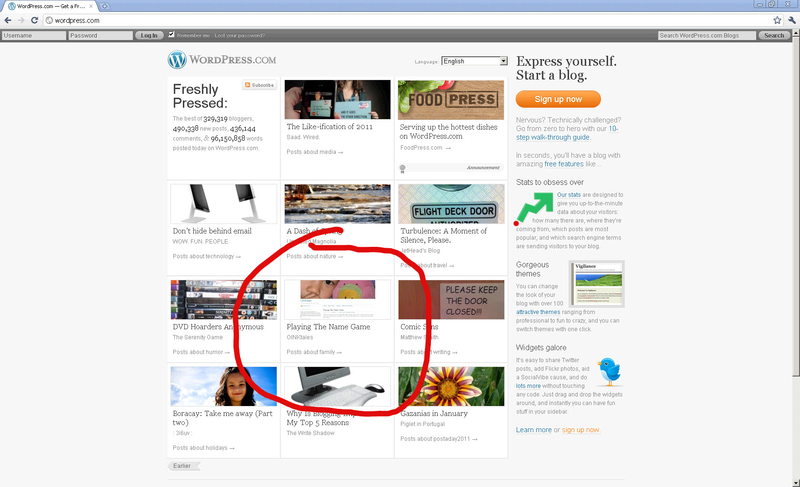 Yesterday, WordPress editors featured OINKtales on their “Freshly Pressed” page. Traffic to OINKtales jumped exponentially and 41 people (and counting!) have commented on “Playing the Name Game.” In the fast-moving world of the internet, people don’t get fifteen minutes of fame. They get fifteen seconds. But these feel like my fifteen seconds and truly, I am enjoying every one of them! Thank you, Readers, near and far! Thank you for reading, liking, commenting, laughing and sharing. I love to write. And though I write because I want to, for my family and for myself, it is thoroughly rewarding to believe that there other people not affiliated to me by bond or blood who are amused by my words. One of the wonderful things about being a blogger is making connections with people I might not have connected with otherwise. And finally (although this is beginning to sound like an acceptance speech – t’is the season, after all), thank you, WordPress! Thank you for spotlighting your bloggers on your “Freshly Pressed” page; it’s an honor and a privilege. Well deserved attention to one of the most enjoyable blogs I read. Sure, I’m biased and the commentary may seem extra funny to me knowing the Oink clan but when I point other folks your way they enjoy the writing as well. You have a great knack for capturing the ins & outs, the funny and bizarre, and the putting the everyday chaos we all endure into context. congratulations on being freshly pressed… i enjoyed your name game post. it was as funny as true. Thanks, Diane. I still can’t believe I was “pressed.” Hope you visit again, soon! Congratulations on being freshly pressed. I’m also an OINK, have been for almost 10 years…it is an interesting life-style choice in the current economy! Agreed! I sometimes rue the OINK-yness of it all, such as when the boys can’t fall asleep because they are obliged to share a bedroom. Someday, I hope that all the kids will understand that my presence (no matter how grumpy I seem at times) was really their present. Thanks for stopping by! Happy blogging to you too! It IS an adventure. Sometimes the trek is easy and sometimes it’s hard but I believe that old adage “Life is what you make of it.” See you in the blogosphere… It’s -20 degrees Fahrenheit here. Better dig out your extra blankets! Well done, Mary! Congratulations to you (and your merry band of blog-makers)! Thanks Lisa! Thanks for being a regular reader and thanks for commenting! This “freshly pressed” thing has been a trip! So glad you were Freshly Pressed! Your writing style is funny and totally relatable! Keep up the good work… I bet you can get another well-desreved 15 minutes! Thanks Tori! I’m glad I was FP’d because through it, I found your blog too. Take good care! Happiness: Comes from the choice to stay at home with your children. Blessings to you and yours. They were wonderful years for us. Thank you Aligaeta. I do feel blessed to be home with my children although I have to admit there are days that the blessing feels more like a curse. But we try to have fun and retain our senses of humor. I appreciate your comment and your visit!